Japanese stilt grass (Microstegium vimineum), occasionally called bamboo grass as well as other names not fit to write, is considered an exotic invasive plant and poses a threat to many of our native plants and habitats. Microstegium is believed to have been introduced to the United States in 1919 in Tennessee. The grass was used as a packing material around porcelain products shipped to America. This annual plant can produce thousands of seeds before dying in the late summer to fall. It thrives under low light levels combined with moist acidic soils, and is known to invade open forest woodlands, wetlands, gardens, fields, ditches, and open corridors. If allowed to grow undisturbed it can reach a height of 2 to 3 1/2 feet. 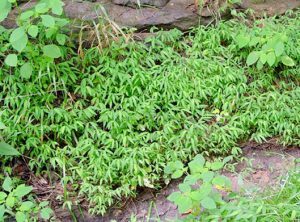 Like many invasive weeds, this plant has many ways to spread its seed including wind, rain, and hitch hiking on shoes, pets, and deer. If only those same deer would eat this invasive grass we would have fewer issues with deer, but no they don’t eat Japanese stilt grass. There are several options for managing this grass. Since this plant produces many seeds, which are viable for up to five years, preventing the seeds from germinating or developing is the primary method for managing this pest. This can be done chemically, mechanically, or manually. The manual method of hand weeding this grass turns over new soil, so individuals choosing this method of management should be aware that new weeds seeds are being brought to the surface, exposed to light, and could germinate and perpetuate the problem. When manually weeding this plant it important to remove it before it goes to seed. These weeds should be bagged and disposed of offsite to prevent the re-dispersal of seed. Mechanical management of Japanese stilt grass involves mowing the plants in the late summer while they are flowering, but before they have gone to seed. Research studies have shown that if this plant is mowed too early in the season it will bloom and develop seed prematurely in order to ensure its succession. The plant can be effectively managed chemically, but timing is critical. Pre-emergent herbicides can be applied in early March to prevent seeds from germinating. Imazapic is the active ingredient (Journey®) that has shown effective at managing this weed when applied at the recommended rate. 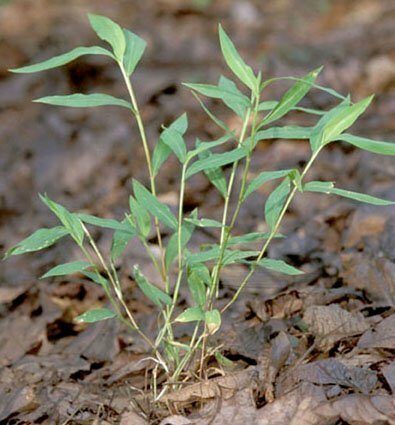 Keep in mind, if you choose this method of managing Japanese Stilt Grass, note that it germinates earlier than crabgrass. This means that the pre-emergent to control this weed must be applied earlier than crabgrass pre-emergent. If Japanese stilt grass has already germinated, it cannot be managed by the use of a pre-emergent herbicide. Those herbicides work by preventing seed germination. A post emergent herbicide can be used to manage large infestations. The active ingredient, glyphosate, is a non-selective herbicide, which can be used. As a non-selective herbicide, extra caution should be taken to prevent non-targeted plants from being sprayed. This chemical makes no distinction between plant types. Ideally, the most effective, safe, economical, and environmentally friendly method should be employed when managing this weed. When choosing a chemical method the fewer weeds there are the less chemical is needed. Prevention goes a long way towards successful management. Always read the label when applying pesticides and follow the label recommendations and wear personal protective equipment. For more information visit www.nps.gov/plants/alien/fact/mivi1.htm. Michelle Wallace is a garden writer.